The most common type of heart surgery is Coronary Artery Bypass Grafting (CABG). CABG improves blood flow to the heart. Surgeons use CABG to treat people who have severe coronary heart disease (CHD). CHD is a disease in which a waxy substance called plaque builds up inside the coronary arteries. These arteries supply oxygen-rich blood to your heart. If the plaque ruptures, a blood clot can form on its surface. A large blood clot can mostly or completely block blood flow through a coronary artery. This is the most common cause of a heart attack. A healthy artery or vein from the body is connected to the blocked coronary artery during CABG. The grafted vein or artery bypasses the blocked portion of the coronary artery. This generates a fresh path for oxygen-rich blood to flow to the heart muscle. Surgeons can bypass multiple blocked coronary arteries during one surgery. TMR or Transmyocardial laser revascularization, is surgery used to treat angina. In case TMR is done, the procedure may be exeuted through a small opening in the chest. During TMR, a surgeon uses lasers to make small channels through the heart muscle and into the heart’s lower left chamber (the left ventricle). Heart surgery is performed to repair leaflets that do not open as wide as they should. This may happen if they become stiff or thick or fuse together. As a result, not enough blood flows through the valve. Heart surgery also is used to fix leaflets that don’t close tightly. Rather than only moving forward into the arteries as it should, this issue can make blood leak back into the heart chambers. To fix these problems, surgeons either repair the valve or replace it with a man-made or biological valve. Biological valves are made from human, cow or pig heart tissue and may have man-made parts as well. To repair a mitral or pulmonary valve that’s too narrow, a cardiologist will insert a catheter through a large blood vessel and guide it to the heart. The cardiologist will put the end of the catheter in the narrow valve. They will deflate and inflate a little balloon at the tip of the catheter, to widen the valve, allowing more blood to flow through it. This approach is less invasive than open-heart surgery. Arrhythmia is an issue with the rhythm or rate of the heartbeat. Surgical methods are used to implant an implantable cardioverter defibrillator (ICD) or a pacemaker. An ICD is a device which is connected to your heart with wires. After checking your heartbeat, if the device senses a dangerous arrhythmias, it sends an electric shock to your heart to restore a normal heart rhythm. Wires connect the pacemaker to your heart chambers. The device uses low-energy electrical pulses to control your heart rhythm. Most pacemakers have a sensor that starts the device only if your heart rhythm is abnormal. Another arrhythmia treatment is called maze surgery. For this type of surgery, the surgeon creates a fresh paths for the heart’s electrical signals to travel through. This type of surgery is used to treat atrial fibrillation, the most common type of serious arrhythmia. An aneurysm is a balloon-like bulge in the wall of an artery or the heart muscle. Repairing an aneurysm involves surgery to replace the weak section of the artery or heart wall with a patch or graft. 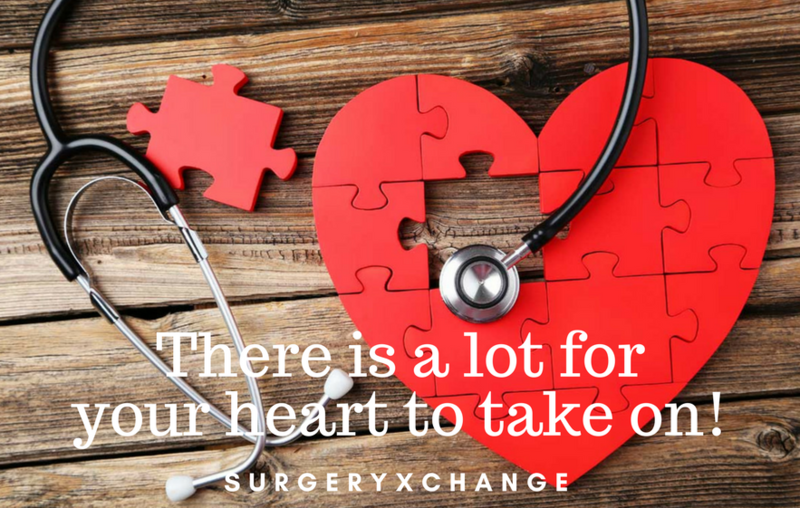 A surgery or surgical method to remove a patient’s diseased heart and swap it with a healthy heart from a deceased donor is heart transplant. Heart failure is a condition in which the heart is damaged or weak. Patients waiting for a donor heart receive an ongoing treatment for heart failure and other medical conditions. Total Artificial Hearts (TAHs) or Ventricular Assist Devices (VADs) might be used to treat these patients. TAH is a device that replaces the two lower chambers of the heart (the ventricles). VAD is a mechanical pump that is used to sustain blood flow and heart function in people who have weak hearts. Placing either device requires open-heart surgery. Open-heart surgery is a type of surgery in which a surgeon makes a large incision in the chest to open the rib cage and operate on the heart. The surgeon also may open the heart, depending on the type of surgery. Open-heart surgery is used to place VADs and TAHs, do heart transplants, treat atrial fibrillation, replace or repair heart valves, and do CABG. Surgeons also use off-pump, or beating heart, surgery to do CABG. The heart isn’t stopped, and a heart-lung bypass machine isn’t used. A surgeon makes small incisions in the side of the chest between the ribs for minimally invasive heart surgery. A heart-lung bypass machine may or may not be used in this type of surgery. Minimally invasive heart surgery is used to do some bypass and maze surgeries. It’s also used to repair or replace heart valves, insert pacemakers or ICDs, or take a vein or artery from the body to use as a bypass graft for CABG. Robotic-assisted surgery is a type of minimally invasive heart surgery for which a surgeon uses a computer to control surgical tools on thin robotic arms. Are you jogging between 140 to 190? There is a lot for your heart to take on!